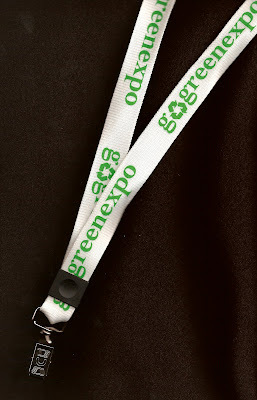 We were please to have the folks at the Go Green Expo use our lanyards printed on recycled material. They had a re-attachable safety breakaway connector, so they are green and safe. 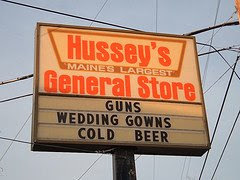 It's a nice combination. For folks who maybe stopped by an officer and have concerns, police had this advice. "If you get pulled over by a police officer and you are concerned call 911 on the cell phone. Also, ask to see the police ID not just the badge, but the identification cards that we carry," said O'Connell. Out of 10 companies I might visit, I am lucky if one painlessly verifies my identity and issues a personalized visitor credential. Most have me sign the old paper log, assume I must be who I say I am, and hand me a dog-eared visitor badge left over from the Nixon administration. At least one or two out of the 10 doesn’t even use a log book; just a wave to “come on back.” Let’s just say that visitor management is pretty low on the list for most companies. Read the five points and more here. It's good stuff. That is why people with questions about someone claiming to be a plainclothes deputy need to ask for more, Malagon said. We say: While you at it, go ahead and add a few security features to the photo ID card to ensure authentication. A COLOUR-code system has been developed to stop Australia's "best and brightest" from getting lost at Kevin Rudd's 2020 Summit. Each of the summit groups has been allocated a colour, with participants to get a matching lanyard so they know where to go. Uh oh... looks like there's some homogenization going on in the warehouse. Dont tell the boss. For those who are addicted to bluetooth headsets, leatherman multi tools, keyfobs, neo-pets and other hangy-things, we proudly present Frankenstein Lanyard (...its ALIVE). Made from all kinds of stuff - like hot dogs - this lanyard is sure to fit the needs of the "customer who wants it all, but doesn't understand part numbers". 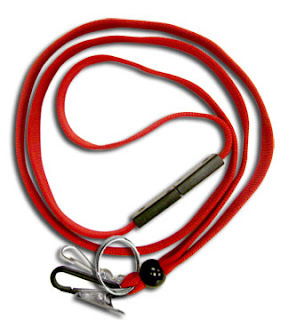 It features a springy-bulldog-metallic-plastic-hook-clip-thingie. (Whew) Estimated MSRP is projected to be around, well... er, we're not sure. Warning - this product may cause neck strain and confusion. 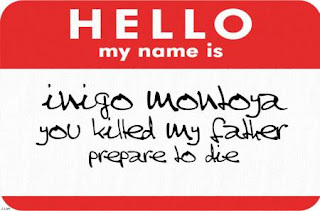 OK - if you actually want one of these, I guess we could go ahead and make it, but this is not a real lanyard. It's a by-product of bad photoshop layering, and a late night of keyboarding. Could be something for the old r & d bin... we'll have to see who really wants it. We love seeing our products out in the public eye. 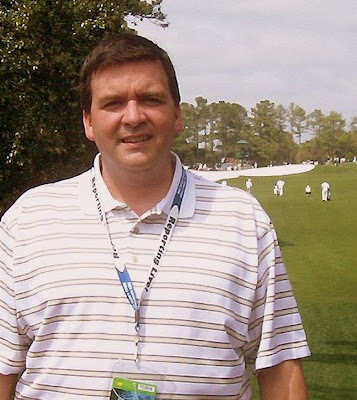 Here is one of our custom lanyards and ticket holders at The Masters this week. Nice. 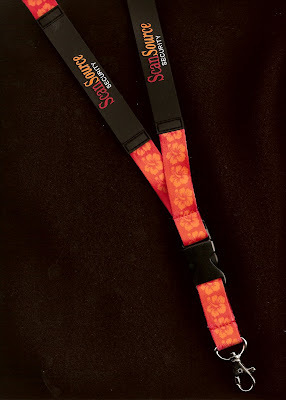 We were informed by our customer that these were the "lanyard of the show" at ISC-West. They gave almost all of them out the first day and we saw them everywhere that we went in the building. There is no doubt that our dye sublimation printed lanyards with soft PVC insert look and feel great. They are perfect when you want a first class presentation in neck lanyards and to display credentials. Susan wasted a lot of time "looking for her ID card"
WARREN, Mich.—A would-be bank robber came away empty-handed but left behind something useful for police: her photo identification. The woman was arrested less than an hour later on a charge of attempted armed robbery, Police Commissioner William Dwyer said. The woman filled out an account application Thursday morning, then pulled a handgun and demanded cash, Dwyer said. She panicked and fled without getting any money; police found an address on the account application, along with her photo ID. The address was for an apartment near the bank. The manager gave the woman's new address to police, who arrested her without incident. "We're probably not dealing with the smartest person in the world," Dwyer told The Detroit News. DHS all but told the state Monday that it was the country's "weakest link" and that the state needed to change its licensing ways or face the fed's wrath. New Hampshire just lost there motto "Live Free or Die"
Does the public understand what Real ID is all about? Some of the rebelling states are making good points. It would have been a good idea for the federal government to build consensus on this program and establish dialog on funding. From the tone of this news story it does not appear the school district has thought out and communicated a cohesive implementation plan. Education, acceptance, and student/parent buy-in are critical to a successful school ID card program. Read the "The Secure School" post below and you will get a good idea of what we mean. This is an interesting news story from the UK. It could have been a huge embarrassment (or problem) for the British government if this guy had not been about as harmless as Otis in Mayberry. The system is only as good as the training provided. Security personnel need to know how to inspect an ID card properly and then do it consistently. 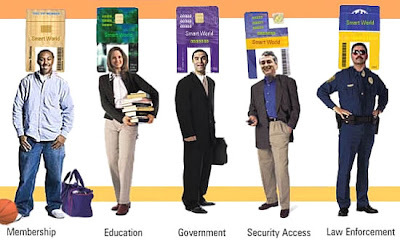 Adding visual security technology is an efficient method for card verification by security staff. It's low cost and easy to implement. Access control technology in secure areas is a must. Waiting until after a security problem has occurred is the wrong time to start thinking about it. Proactive security measures is smart and sensible.